My last post was my 1000th post. How is that even POSSIBLE?! I completely missed my blog’s birthday (June 19) and its four-year anniversary of existence. Holy. Hell. So much has changed … In many ways, I’m a completely different person since I began blogging in 2008. For one, my blog’s name has changed multiple times along my recovery journey. And for another, I’m now a mom. Nothing has changed my life as much as becoming a mom. I still have moments of doubt and insecurity. I still tend to over-analyze things that happen in my life. Though I don’t beat up my body anymore, I also don’t always treat it as well as I could. I still emotionally eat from time to time and I still have 10 pre-baby pounds I haven’t lost that I waffle on wanting to lose/not caring to lose. Some things might always be part of me. 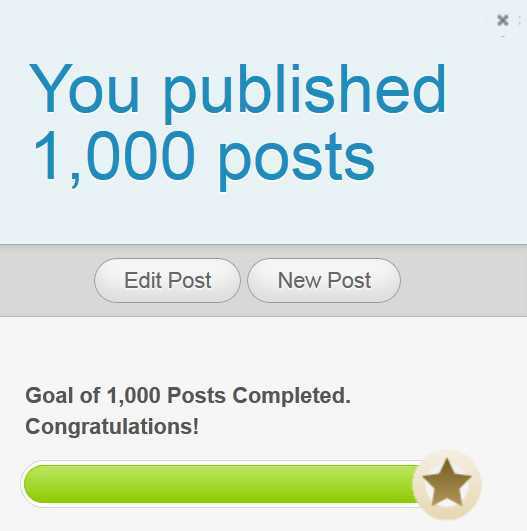 But this me — who has written 1000 blog posts — feels optimistic about the future and my writing career (someday!) and being a good role model for my daughter. I don’t know much, but I do know this: without blogging, I wouldn’t be where I am today mentally. Therapy only got me so far … I needed the self-awareness and introspection (albeit via a very public platform) to get to this place. And I’m not turning around. Please join me in wishing my blog a happy belated birthday!!! congrats! I love reading your blog. I am a lurker but enjoy your blog. Congratulations, that is quite an accomplishment! 🙂 Thanks, I really am! And I would love that if the time comes. Working on it … 😉 And I would appreciate any and all pimping!